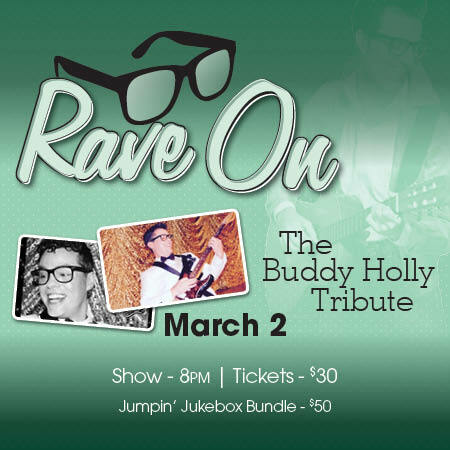 Rave On: The Buddy Holly Tribute is a night of music featuring all the hits that shot Buddy Holly to fame. From his meteoric rise in 1957 to his tragic death on the day the music died, Rave On features over 20 of Buddy Holly's greatest hits including “That’ll Be The Day”, “Peggy Sue”, “Everyday”, “Oh Boy”, “Not Fade Away”, “Rave On” and ‘Raining In My Heart”, plus a tribute to Ritchie Valens' “La Bamba” and The Big Bopper's “Chantilly Lace”. Rave On will have you dancing and singing along as you're taken back to the Golden Days of Rock & Roll, when a kid with glasses and a guitar stole the hearts of millions!